This past weekend the guys in my family went to the Clippers game and the girls went out to eat and to Easton. We had a great time and the girls had a ball. 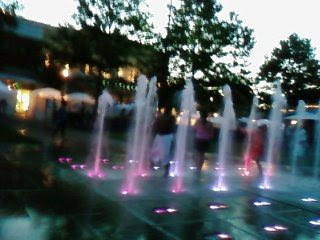 We’ve never been over to the fountains at Easton so this was a new adventure. At first they were a little apprehensive but after awhile Aiva got the hang of it. She couldn’t stand watching all the kids play in the fountains and her watch from afar. 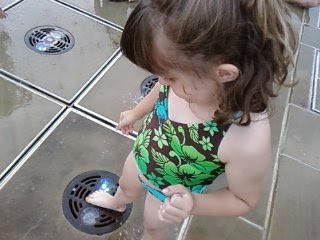 After about 10 minutes she put her foot on the fountain and let the water run through her toes. She thought that was pretty funny. Once her toes and legs got wet she was officially ready to go for it. At one point she ran over to me and asked if I had her ear plugs. Of course I wasn’t thinking we would need them and left them at home. I shooed her back to the fountain and told her that she’d be fine. She ran back with her hand covering her right ear and told me that she had her own “plug’. Ana never did get the hang of it and only ran back in forth between the fountain and where we were sitting. She was all smiles watching her sister and the other kids playing in the water. She truly is not a water baby…or so I thought. Both girls started swimming this week at the Rec Center and they both LOVE it! 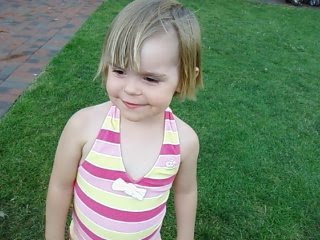 Aiva was ready for swim lessons weeks ago but Ana has never been one to get into water on her own. The lessons I signed Ana up for required Nate to get into the water with her so I think she felt a little more comfortable with having daddy by her side. They do “Ring around the Rosey” and London Bridge is Falling Down” and I guess Ana has a ball. She even went under the water 5 times yesterday. The teacher said she’s the best kicker in the class. Looks like that trip to Alum Creek beach last weekend paid off! As you can see were having a great summer and can’t believe it’s already July! We’re one month away from our vacation! Yeah! Hope you all have a Happy 4th!